Rose water is a by-product of the production process of rose oil for perfume. In the past rose water was known only for its aroma. However, it is now recognized for its various benefits in beauty and skin care. It has anti-inflammatory, antibacterial, emollient, cleansing and toning properties. 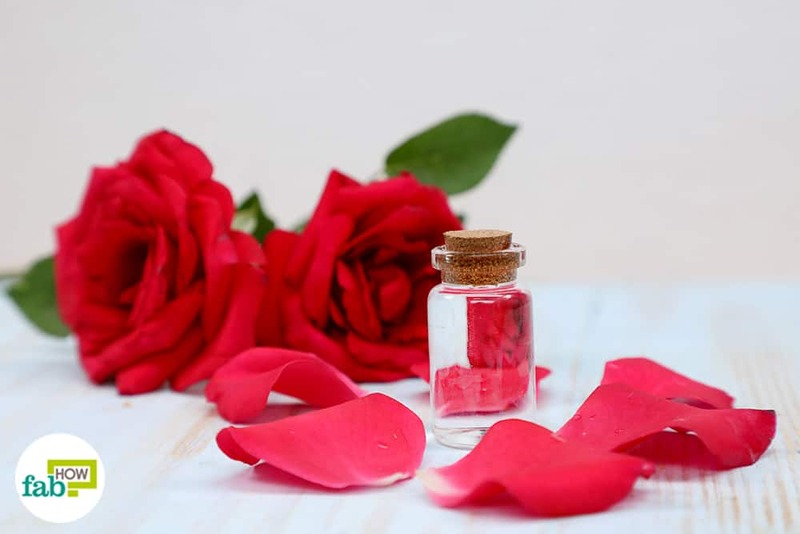 The use of rose water has been traced back to the ancient Greek and Egyptian eras. Once considered the “queen of flowers,” roses held a very high significance. Known as a product for famous queens’ daily beauty regimens, as well as being used in various religious practices even today. There are numerous ways that you can use rose water to achieve glowing skin. Some store-bought toners are alcohol-based and can quickly cause your skin to become dry. When this happens, it can begin to hinder the tissues recovery process. Rose water has an antibacterial property and is a natural toner, which unclogs the hair follicles and pores by removing accumulated oil and dirt without drying out the skin. The witch hazel in this recipe is another toner with natural plant extracts and has anti-irritant properties. It is commonly used to remove excess oil secreted by the skin. 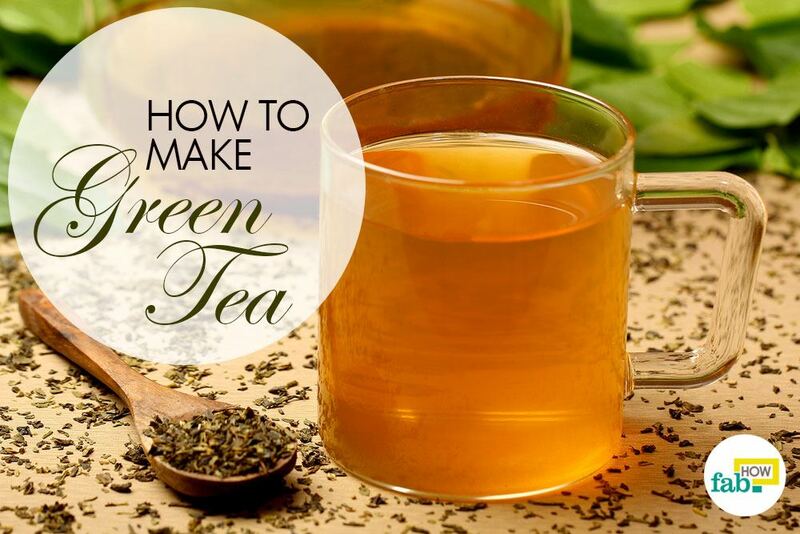 It also has anti-inflammatory and antioxidant properties that will help soothe your skin. Lavender is an essential oil known to calm your nerves and aid the skin's healing process. Pour 2 tablespoons of rose water into a spray bottle and add 1 tablespoon of distilled water to it. 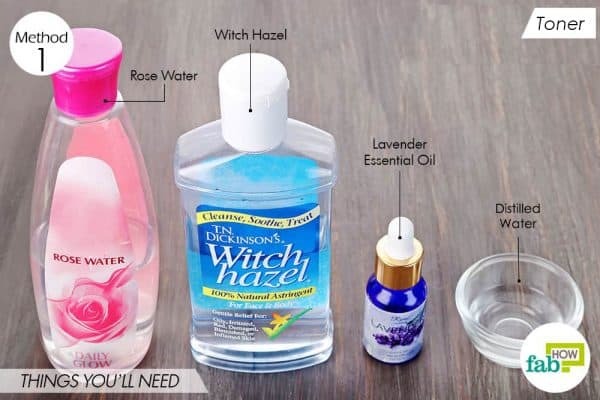 Add 1 teaspoon of witch hazel and 1 drop of lavender essential oil into the mix. Shake the bottle so that all the ingredients blend well together. Use this twice a day, just like you would use your regular toner for beautiful skin. You can store this solution for up to 2 to 3 weeks in a cool and dry place. Rose water penetrates the skin deeply and clears away dirt and impurities. Castile soap is a mild cleanser. 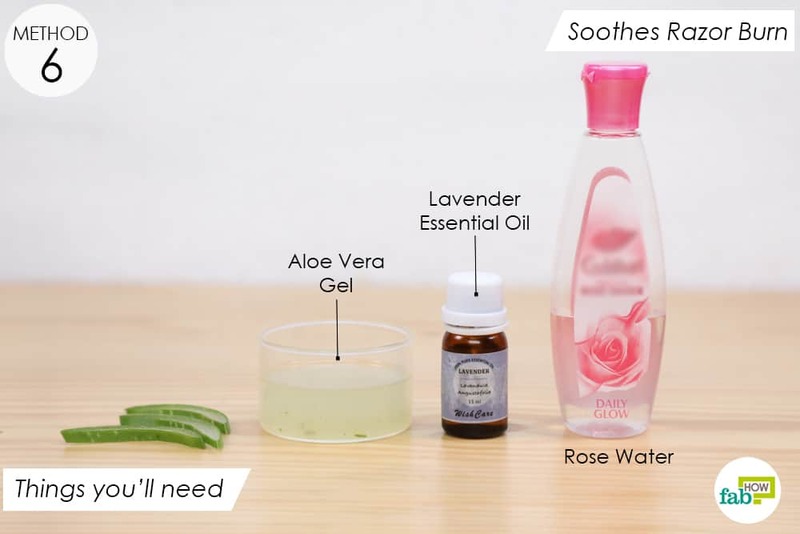 It is often recommended for people with allergies and sensitive skin, which makes this recipe suitable for all skin types. Vegetable glycerin is a natural viscous liquid extracted from plant seed oils, mainly from coconut, soy, and palm. Known as a powerful humectant, it will help seal in the moisture on the outermost layer of the skin. Vitamin E oil helps reduce dark circles, fine lines, and wrinkles by strengthening the skin’s elasticity and repairing any skin damage caused by free radicals. Pour 6 tablespoons of rose water into a jar. 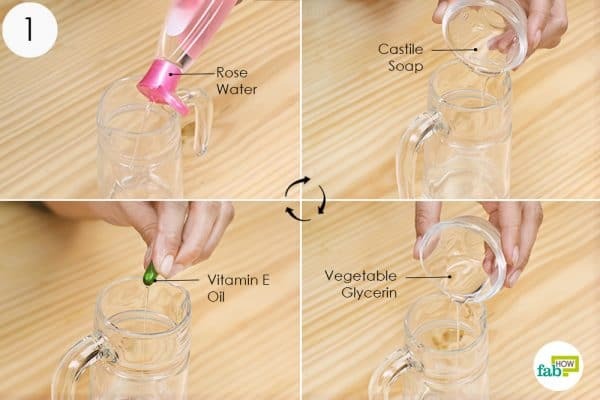 Add 1 teaspoon of unscented castile soap and ½ tablespoon of vegetable glycerin to the rose water. Puncture vitamin E oil capsules and extract 1 teaspoon of oil. Add it to the mix. Mix all the ingredients using an electric whisker. Pour the mixture into a pump bottle. Use it as you would use a face wash, twice a day. 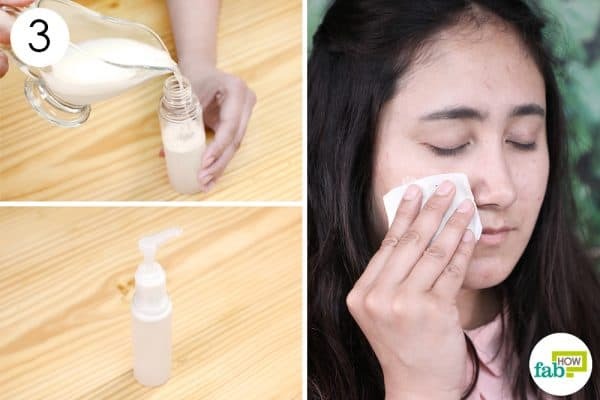 You can store this cleanser for 2 to 3 months. Rose water is beneficial for both dry and oily skin. It moisturizes and restores the pH balance in the dry skin. The sugars present in rose petals give rose water a skin-soothing effect, and its natural oils seal moisture into the skin. Also, its astringent properties help remove excess oil produced by the skin and tone it. Dryness generally leads to premature aging of the skin. Honey is a natural humectant, which draws moisture from the air and retains it in the skin. 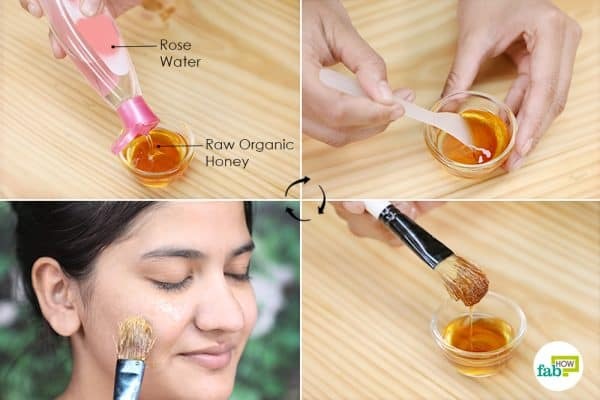 Honey also has skin-tightening properties that help reduce the size of your pores and smoothen out wrinkles and fine lines. 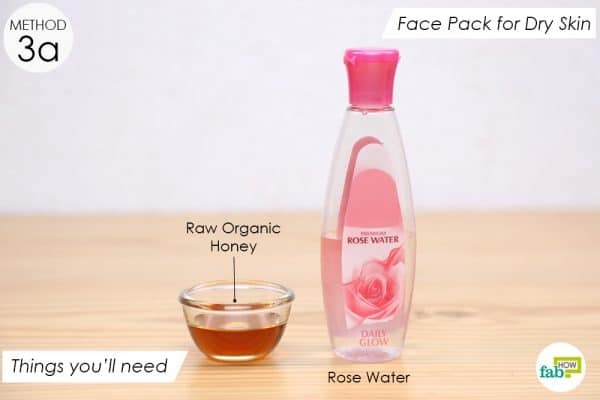 Mix 1 tablespoon each of raw organic honey and rose water. Apply the mixture to your face using an applicator brush. Allow it to sit for 20 minutes, then rinse it off with water. Use this pack twice a week for supple and glowing skin. 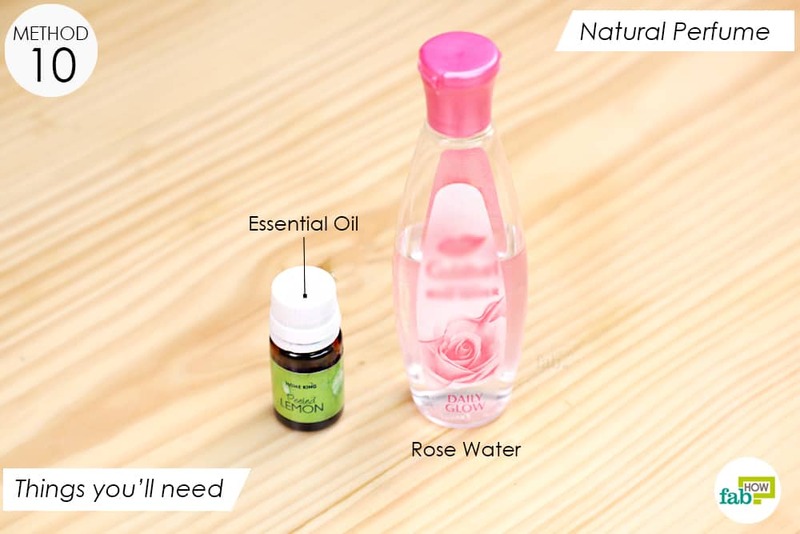 The astringent property of rose water helps fight the excess oil and dirt clogged in the skin. The lemon in this recipe is rich in vitamin C and has antibacterial properties. Lemon also strengthens the skin’s collagen and promotes elasticity. 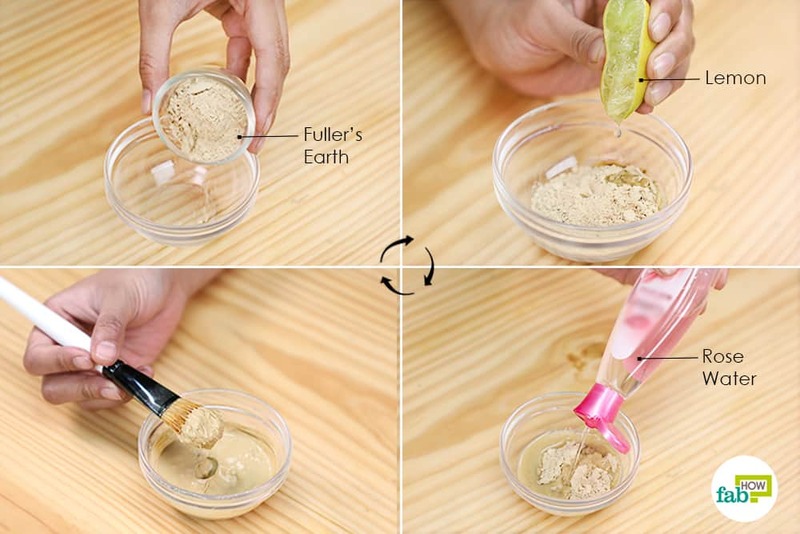 Fuller’s earth helps clear the excess oil from the skin and reduces the appearance of pores. 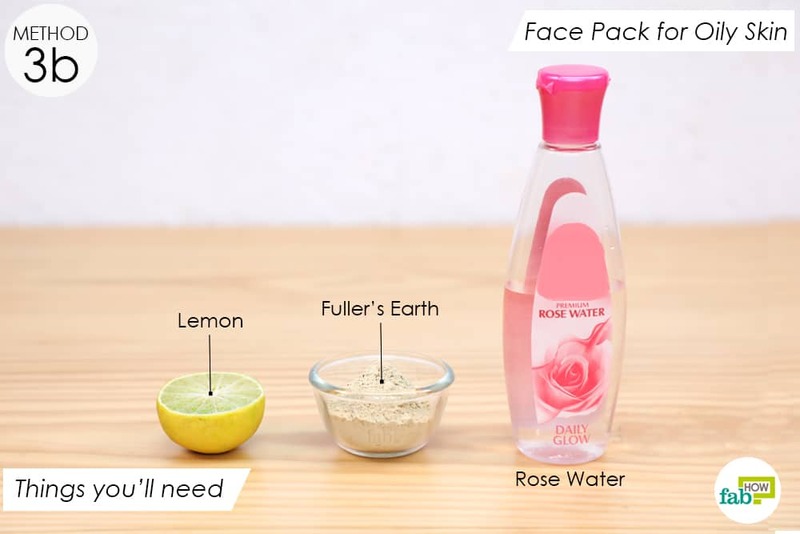 Mix 1 tablespoon each of fuller’s earth and rose water, and add a few drops of lemon juice. Apply the paste on your face and leave it on until it dries. Once dry, wash it off with water. Use this pack twice a week for blemish-free skin. Melanin is responsible for the cause of hyperpigmentation in the skin. Lemon controls the production of melanin and has a skin-lightening property that will help reduce dark spots left by acne scars. Rose water evens out the skin tone by soothing the inflamed spots. 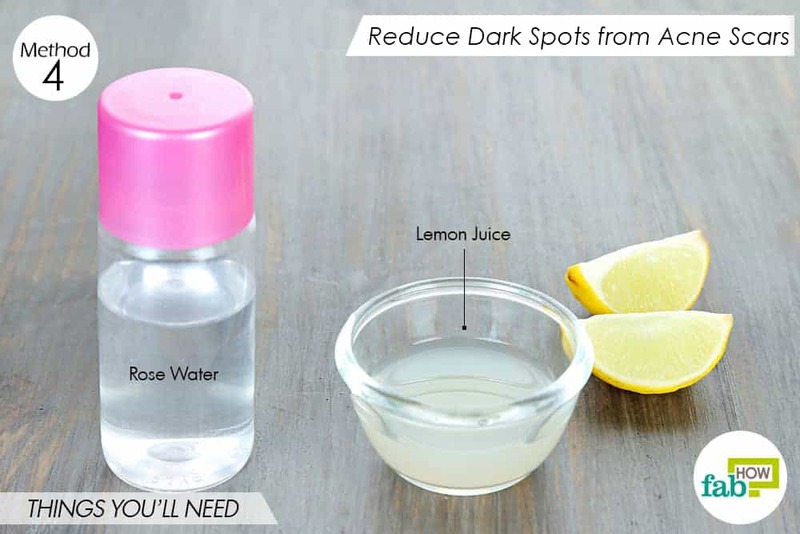 Mix 1 tablespoon each of rose water and lemon juice in a bowl. 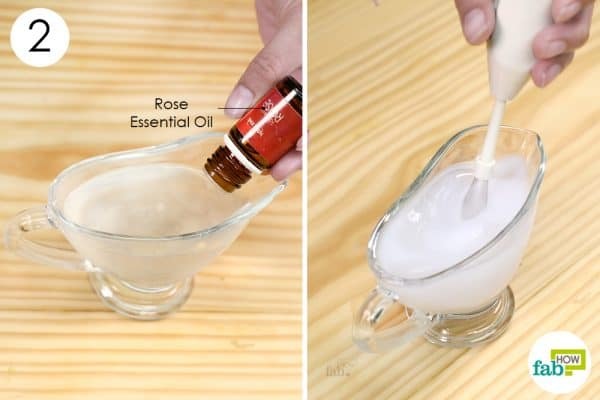 Use a cotton swab to dab it on the dark spots. Preferably, do this at bedtime and leave it on overnight. 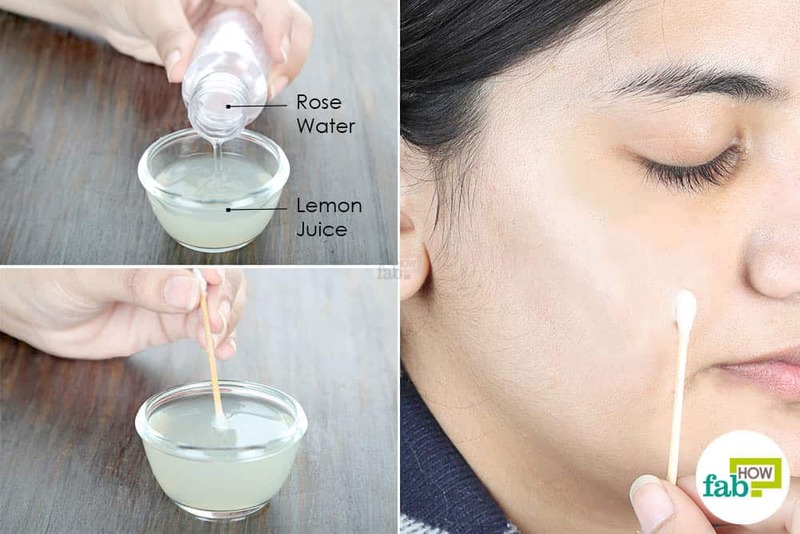 In the morning, rinse your face with water. Repeat daily for 1 to 2 months to see reduced dark spots and a brighter skin tone. 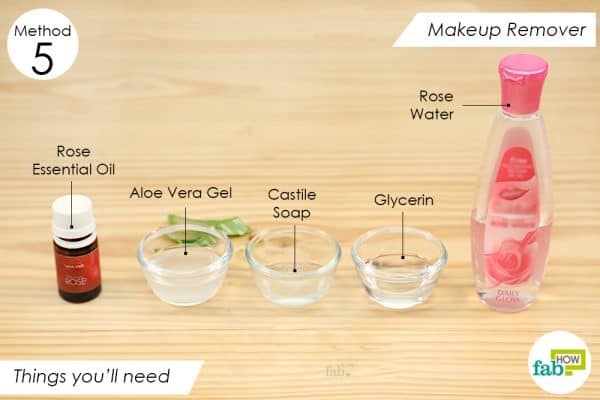 Rose water along with aloe vera has rich water nutrients that help hydrate the skin during makeup removal. Glycerin and castile soap retain the moisture and are gentle on the skin. The oily texture and antioxidant property of rose essential oil make the skin smooth and healthy. 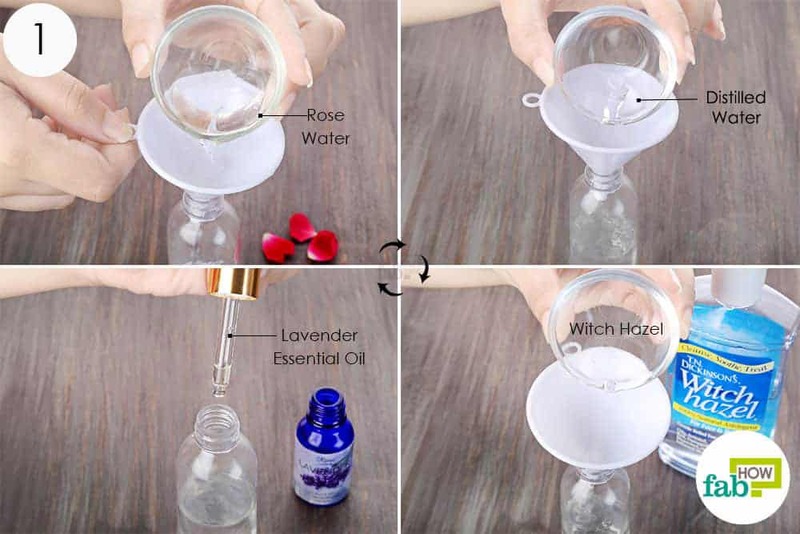 Pour 1 cup of rose water into a bowl. 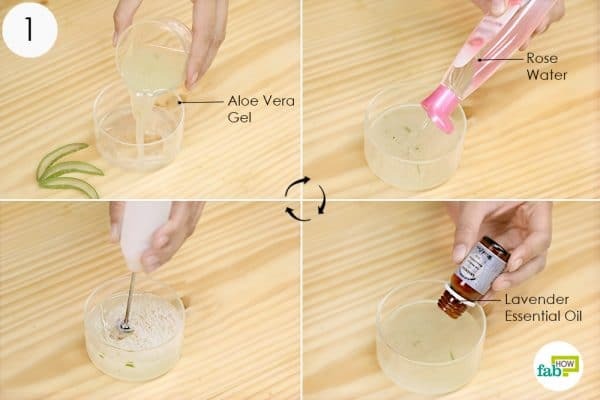 Add ¼ cup of aloe vera gel, followed by 2 tablespoons of glycerin and 1 tablespoon of castile soap. Whisk the ingredients until they are blended well. 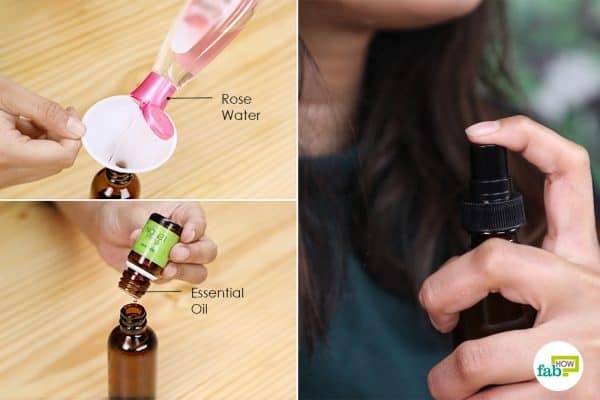 Pour the remover into a pump bottle. Squirt a little on a cotton pad and wipe off your makeup. 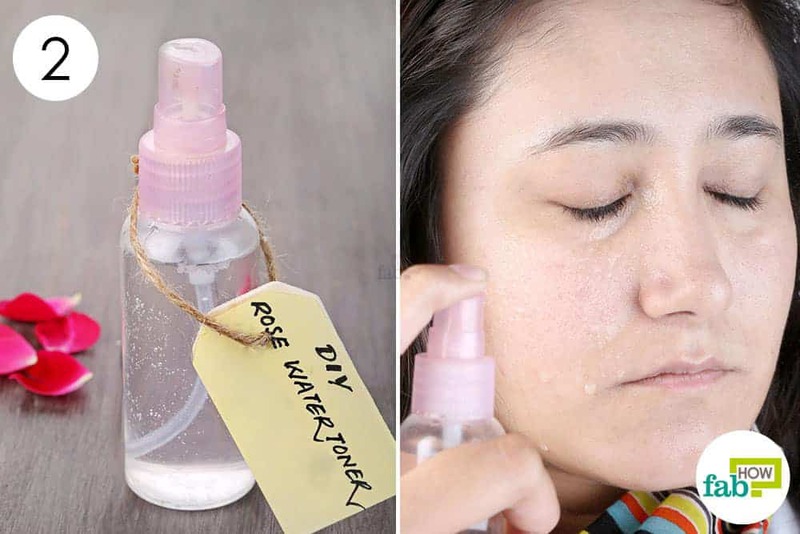 You can store this DIY remover for 2 to 3 weeks in a cool and dry place. Rose water has a distinctive cooling property that helps heal inflamed and irritated skin. This recipe also uses aloe vera gel, which is known to cure wounds and soothe the skin. It is rich in water nutrients, which calm the skin and promote a quick recovery. Lavender essential oil supports skin healing and is a mild analgesic, which eases the pain associated with razor burn. Put 3 tablespoons of aloe vera gel in a bowl and add 2 tablespoons of rose water to it. Add 5 drops of lavender essential oil to the mix. 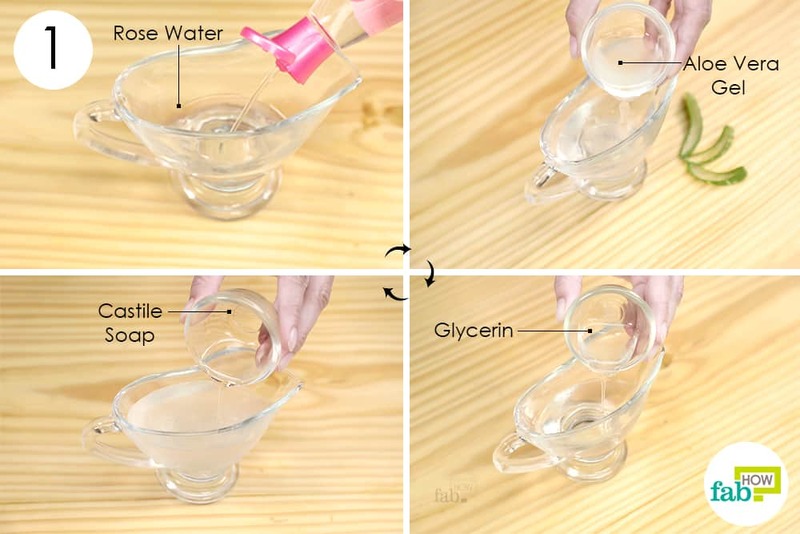 Pour the mixture into a reusable easy-pour bottle. Refrigerate it for at least 3 hours before using it. 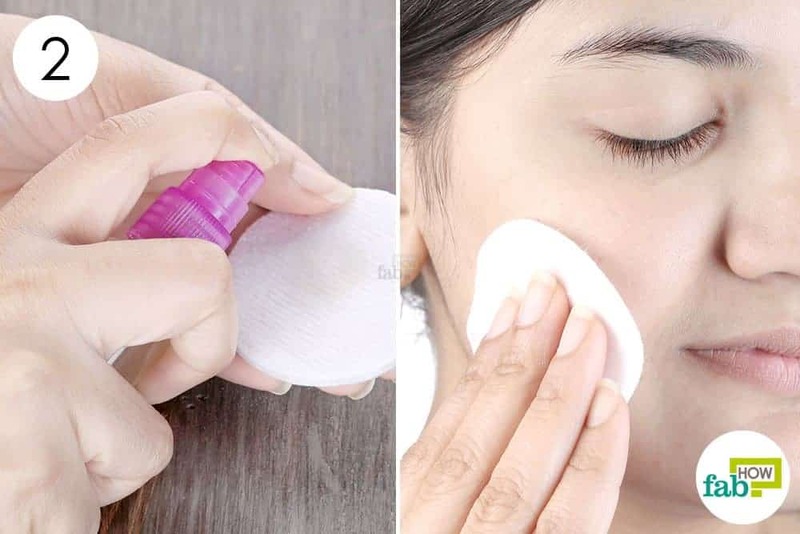 Use a cotton pad to dab it on the razor burn or any cuts and bruises. This solution will last up to 3 weeks when stored in a cool and dry place. Rose water and coconut oil, both used in this recipe, have antibacterial properties. Rose water hydrates the skin, and coconut oil has lauric acid that moisturizes from deep within. Glycerin also has an emollient-like property and is a humectant that softens the skin and helps retain moisture. Pour 3 tablespoons of rose water into a pump bottle. 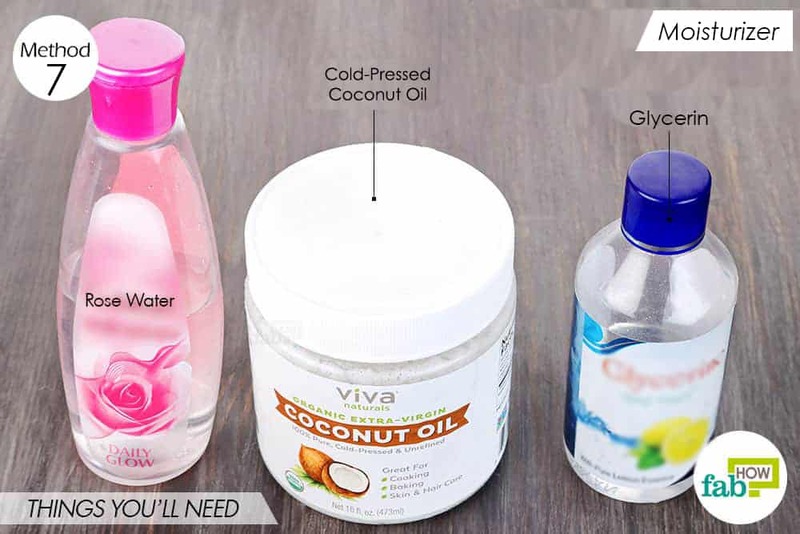 Add 1 tablespoon each of glycerin and cold-pressed coconut oil. Squirt a pea-size amount of the solution on your palms and apply directly to the skin. 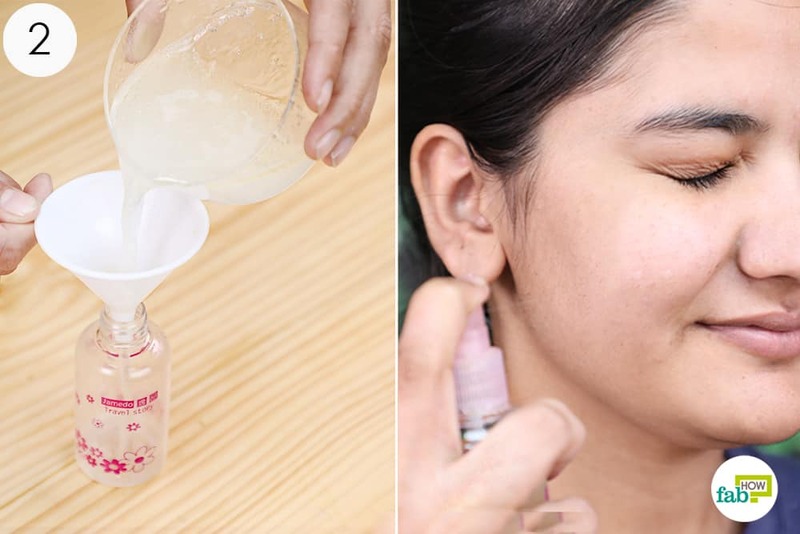 Use this rose water moisturizer twice a day for glowing skin. You can store this solution for up to 2 to 3 weeks in a cool and dry place. 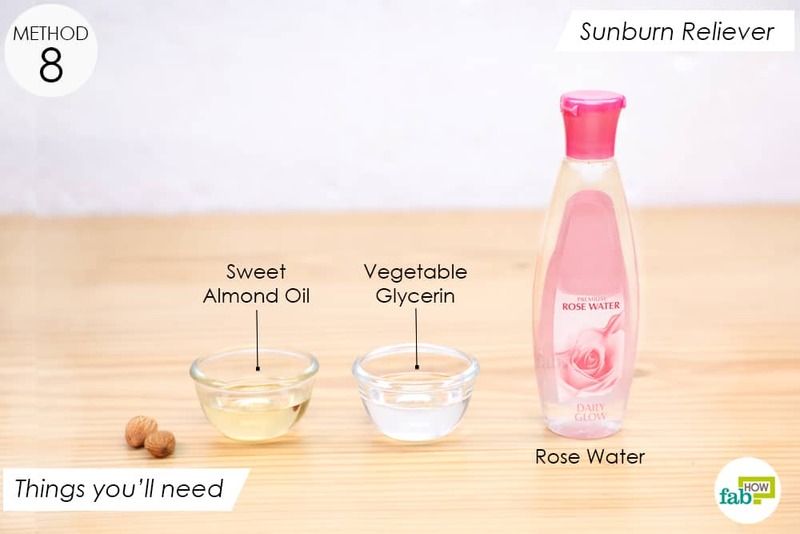 Rose water plays a significant role in reversing skin damage caused by ultraviolet (UV) sun rays. Rose water soothes sunburns and promotes healing. The vegetable glycerin used for sunburn seals in moisture calms the burn and aids faster cellular repair. Almond oil is rich in vitamin E, which is an important antioxidant that heals sunburn. Put 2 tablespoons of rose water in a bowl. Add 1 tablespoon each of glycerin and sweet almond oil to it. Blend the ingredients well using a whisk. Spray the solution on the affected area. Use it as needed. You can store this solution for up to 3 weeks in a cool and dry place. Rose water is a hydrosol that is produced when rose petals are distilled. This hydrosol contains vitamins A and C, which help with skin rejuvenation and reducing puffiness under the eyes. 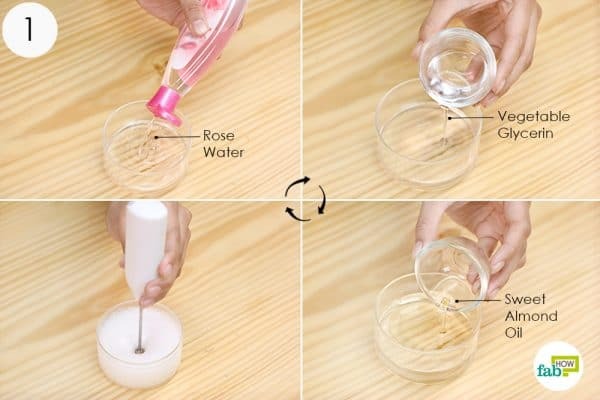 Chill the rose water for 1 to 2 hours before using it. 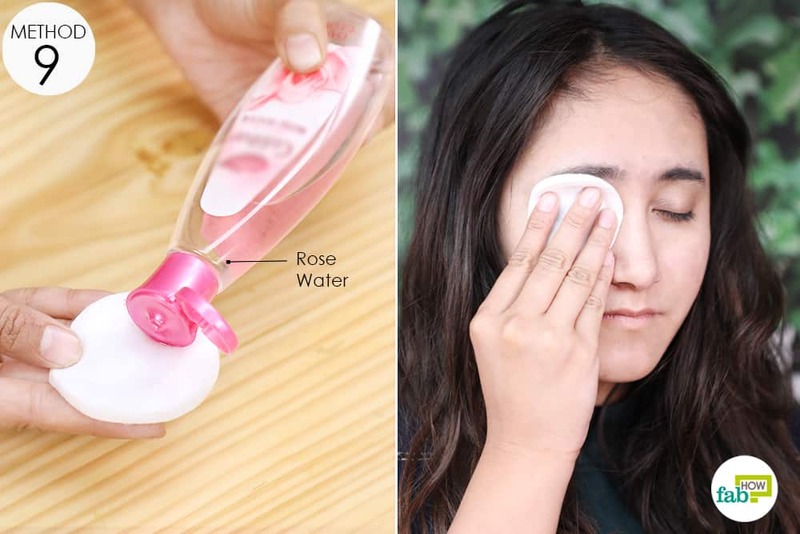 Squirt 4 or 5 drops of rose water onto 2 cotton pads each and place them on your eyes. Leave them on for 20 minutes. Repeat this every day to reduce puffy eyes and dark circles. 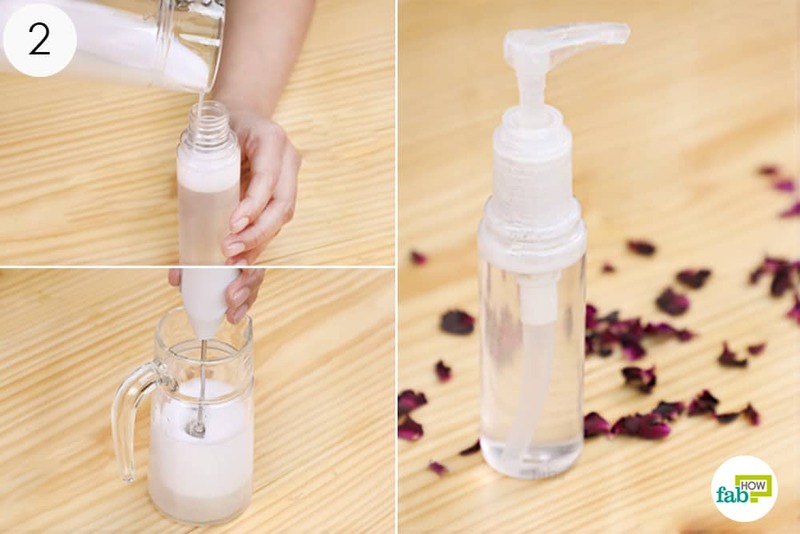 Rose water has a refreshing fragrance making it popular in many perfumes and mists. Pour 2 tablespoons of rose water into a glass spray bottle and add 10 drops of essential oil of your choice. 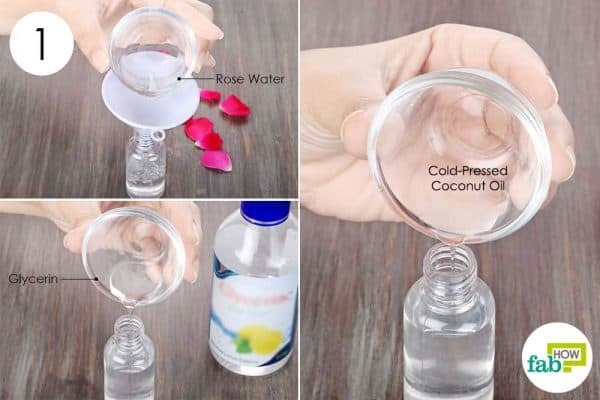 Shake the bottle so that the ingredients blend well together. Spray the mist on your wrist or neck. 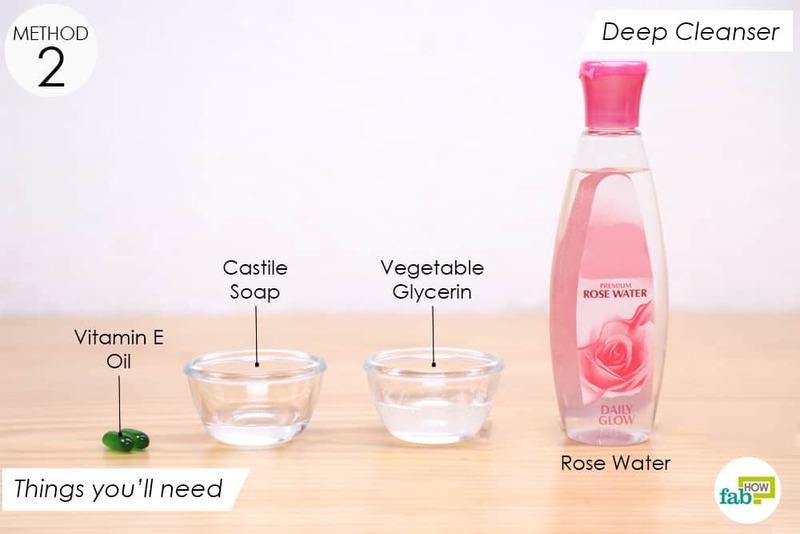 You can make rose water at home to reap the benefits of this amazing flower. You can also make rose petal jam for consuming it post a meal. It helps with better digestion and reduces mouth odor.